Check out our website at www.glcomp.com for current specials and upcoming events. Thank you for visiting! CRN (Computer Reseller News) Magazine has been providing news, analysis, and perspective insights for VARs and technology integrators for more than 30 years. In 1997, CRN launched its UK edition of the magazine that is now available in both print and digital formats. For the past 21 years, CRN has been recognizing pinnacle achievements in the UK market, rewarding those with outstanding performance in the IT channel with the CRN Channel Awards. With 25 categories for vendors, distributors, and resellers, the 2014 awards recognized the latest technology innovations and advancements. One of the 25 vendor categories is Storage Vendor the Year. The award is open to all vendors operating within the storage arena. This includes manufacturers of hardware systems, software, components or peripherals that are relevant to the storage market. This year, Nimble Storage, the hybrid flash storage solutions provider, took that honor. With over 4,300 customers across 38 countries, the Nimble Storage Adaptive Flash platform has taken off primarily through the company’s indirect channel model. This platform empowers IT organizations to predict, manage, and deliver the storage required to optimize business applications and workloads across the enterprise. Nimble Storage is well positioned to quickly expand its business by implementing a 100 percent channel model through trusted advisors that have extensive relationships with enterprises. Nimble Storage continues to focus on maintaining and growing deeper relationships across its partner ecosystem, enabling partners to be self-sufficient through resources and incentive programs that are low-friction and yield high-margins. As the industry leader in network innovation, Juniper Networks has recently introduced a new virtualized version of its flagship MX Series 3D Universal Edge Routing platform with the vMX 3D Universal Edge Router. As the industry’s first ever full-featured, carrier-grade virtualized router, the Juniper vMX provides enterprises and service providers with the ability to seamlessly leverage the benefits of both physical and virtual networking. The vMX router operates as software on x86 servers and rapidly delivers services, cost-effectively allowing businesses to stay ahead of customer demand. Juniper Networks also unveiled a new set of capabilities that assist customers in achieving High-IQ networks that leverage the benefits of automation and virtualization. With the rapid increase of networked devices, enterprises are looking for ways to keep up with the demanding network requirements and increase business agility. Many enterprises have already taken to the cloud as a solution to drive agility and efficiency as obtaining a network that is as dynamic and flexible as the cloud is critical. The Juniper Networks vMX router is a solution to this issue, delivering cloud-like agility to the network and bringing new capabilities to businesses such as the ability to roll out new applications, initiatives, and resources quickly while supporting external and internal clients. Full MX Series supported on x86 servers – vMX runs as a software on x86 servers allowing enterprises to quickly deploy new routing services based on an established Juniper MX pedigree. Benefits of this include the reduced risk and cost of a hardware-centric service roll out and the ability to easily redeploy x86 resources to adapt with changing business demands. Junos and vTrio Optimized – With Junos and vTrio, vMX also supports the same programmable Junos Trio chipset features as the entire MX Series portfolio. This brings current Juniper customers access for a feature set that works across existing virtual and physical infrastructures. 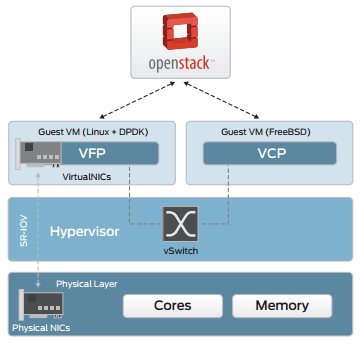 Designed for the Cloud – Although vMX runs natively on x86 serves, it can be orchestrated by Contrail and OpenStack and managed by Junos Space. The vMX feature set delivers the flexibility to use physical and virtual routers based on current business needs by being a consistent operator. By virtualizing the traditional chassis-based routing platform, Juniper Networks brings the feature-set and proven history of reliability and performance of the MX to the cloud. Combining the vMX with Juniper’s complete physical router portfolio delivers valuable tools enterprises need to maintain an environment for virtual and physical routers. With the vMX, carrier-grade routing can provide customers with greater freedom to start small, experiment with new services, grow rapidly, and stay profitable throughout the entire service lifecycle. The Juniper Networks vMX 3D Universal Edge Router will be available in Q1 of 2015. Almost everybody has a server virtualization product of some kind, which means the growth potential for this market is shrinking. So how does VMware, the market leader in server virtualization, plan to evolve their offerings to stay ahead of competitors like Microsoft? Through management software. VMware recently announced the rebranding of their virtualization technologies management suite. Formerly including vCenter Operations Manager, vCloud Automation Center, and IT Business Management, these products will now be under the heading of vRealize Management products. Not only is there a new name, but there are a large number of updates as well. The most significant of these products updates is vRealize Operations 6. Previously known as vCloud Operations Manager, the updates include a new scale-out, resilient architecture that will be 8 times more scalable than its predecessor. Additional new features include advanced analytics, smart alerts, capacity planning and project management capabilities, and problem detection capabilities. Through vRealize Operations 6, VMware provides customers with visibility across applications, network, and storage devices in a single console. vRealize Operations 6 isn’t the only update – other new additions to the vRealize Management Suite include vRealize Code Stream 1.0, and vRealize Air Compliance. vRealize Code Stream 1.0 helps customers develop code faster by working with developer tools like Bamboo and Subversion to automate the entire software release process and enforce governance across release stages. Still in beta, vRealize Air Compliance enables companies to report on the configuration compliance of their mission-critical vSphere infrastructure. The entire VMware vRealize Suite is available in two editions – vRealize Advanced (running $6750 per CPU) and vRealize Enterprise (running $9950 per CPU). VMware vRealize Code Stream 1.0 will be available as a standalone pricing with separate pricing, which will be announced later. VMware vRealize Air Compliance is available in its beta version, with pricing to be announced later as well. Copyright © 2015 Great Lakes Computer. All Rights Reserved. Powered by Blogger.